The government of the state of Jammu and Kashmir (j & k) is in a fix on the issue of trade in shahtoosh, high-quality wool from the neck-hair of the endangered Tibetan antelope, known as chiru. On May 1, 2000, the High Court of j & k had ruled that the government should enforce the law against those engaged in shahtoosh trade in violation of the Convention on International Trade in Endangered Species of Flora and Fauna ( cites ), to which India is a signatory. This was in response to the public interest litigation filed by Wildlife Protection Society of India (wpsi) asking for the ban on shahtoosh trade. The ruling effectively meant a ban on trade in shahtoosh shawls, famous across the world for their warmth and soft, light material.These fetch anywhere between us $2,000 and us $15,000 in the illegal market. The j & k government doesn't know which line to tow -- conservationists or the weavers and traders of shahtoosh shawls. The Indian Wildlife Act does not apply to the state of j & k . The j & k Wildlife (Protection) Act of 1978 classifies the chiru in the Schedule ii , under which trade in the animal parts is permitted and a hunting license can also be obtained. In 1977, the Union government listed chiru under the Schedule i , which prohibits any trade of parts of the animal. The j & k government is yet to amend its Wildlife Act. The word shahtoosh comes from Persian, and means king of wool. Shahtoosh trade can be traced back to several centuries. Hammid Ullah Gaine, president of the Kashmir Valley Shahtoosh and Pashmina Shawl Weavers, Manufacturers and Spinners Association, says, "This tradition dates back to more than 600 years and has a very special status for us. " He mentions that a preacher and administrator, Hazrat Mir Syed Ali Hamadani, hired craftspeople from central Asia to train the people of the Srinagar valley in the art of weaving shahtoosh. Hundreds of families are involved in shahtoosh weaving and trade, though the numbers vary to a great extent, depending on who you ask. Several weavers have sad stories. Mohidin Rather, resident of Tangpora and general secretary of a union of poor weavers, says he has weaved shahtoosh since his childhood. He now has three children. "I've been able to send my children to school because both me and my wife have been working. She'd spin the wool and earn about Rs 40 per day without going out of the house." In almost every household in Tangpora, about eight km from Srinagar, women spin the wool that men weave into the fine, impeccable shawls that the world hankers after. Rather says that weaving shahtoosh can earn as much as Rs 6,000 a month. But the ban on shahtoosh has changed things. "Now we make barely Rs 1,200-1,400. My wife can't find work now," he laments. The family has resorted to weaving pashmina shawls (made from wool of the goat Capra hircus ). Arshad Ahad Bhat, 13, has been a bright student all along. The eldest among six siblings, he and his younger brother have had to drop out of school. Their parents can no longer afford their education. "All along, chief minister Farooq Abdullah has supported us and was strongly against the ban," says Rather, "But after the June 2000 visit of Maneka Gandhi, Union minister for social welfare, he suddenly changed his stance." Shahtoosh weavers and traders say none of their associations were consulted by the government. "It was a jolt," says Rather. Numerous protests followed. There was talk of a rehabilitation package for shahtoosh weavers and traders. The issue has become very controversial. M S Pandit, principal secretary to j & k's department of industries and commerce, says the government is offering a credit plan including an attractive rehabilitation package. "This is only paperwork. Where's the money? The state is already suffering from severe financial crunch," says Rauf Ahmad Punjabi, vice president, Kashmir Chamber of Commerce. Pandit says the government intends to introduce pashmina in a big way. Traders say pashmina would not fare as well as shahtoosh. They fear competition from Punjab and even from Scotland. 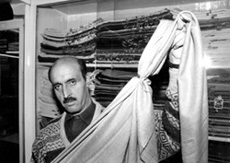 Saifuddin Soz, former Union minister of forest and environment (mef) and a resident of Srinagar, says shahtoosh weaving should be encouraged as it is unique to Kashmir. "It is our duty to protect our endangered species, but the government should work a way to deal with the situation by trying to captive breed these animals," he suggests.